I’ve just published my new “Baby Elephant Blanket” pattern. It’s a Fair Isle style, steeked and fabric-backed baby blanket I made for my dear nephew and his absolutely wonderful wife (whose favorite animal is elephants) as they look forward to welcoming their first little sweetheart. I can’t wait to meet her - I love her already! The pattern has a bunch of action shots, showing you how easy machine-sewn steeks can be. It uses Ella Rae Cashmereno Sport yarn which the folks at Knitting Fever, the distributor, tell me is exactly the same yarn as good, old Debbie Bliss Baby Cashmerino Sport, simply rebranded. (Knitting Fever developed Baby Cashmerino for DB years ago.) Of course, you can use whatever washable sport weight yarn strikes your fancy. I used six colors and needed ten 50g balls in all. I used “Minky” fleece for the backing and borders. It’s incredibly soft and, in the end, gives a wonderful result. If you’re an experienced sewer and you pin Minky heavily, you’ll love it. But, it’s not for novices - it’s sort of like sewing Jell-O! If you’re just getting used to machine sewing, try a more traditional fleece or flannel fabric backing. 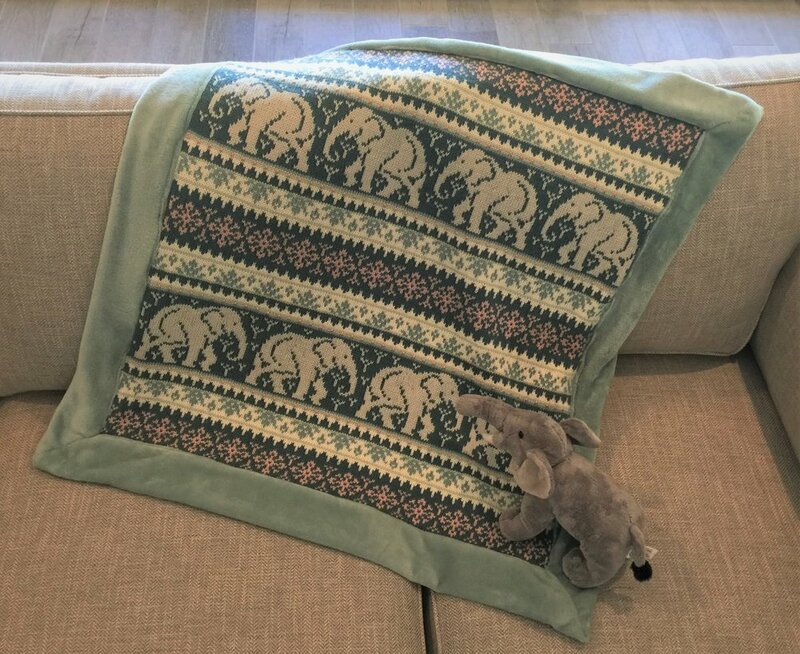 However you decide to finish off your own Baby Elephant Blanket, I hope it becomes a beloved heirloom for your little sweethearts, too.